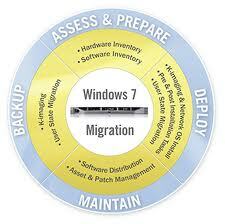 Whether organizations have migrated to Microsoft® Windows Vista® or are still on Microsoft Windows® XP, it’s not a question of if they will migrate to Microsoft Windows 7®, but when. Companies are starting to ask difficult questions, such as: When will their mission-critical applications be supported? How much will it cost to migrate custom applications? Will their current hardware meet system requirements? When can they complete regression testing and workarounds for any uncovered compatibility issues? When can they get the budget and IT cycles to make all of this happen? This white paper describes how Citrix® XenApp™ 5 can be used to help companies simplify and accelerate their migration to the latest version of Windows by delivering both legacy applications that are not Windows 7 compatible and newer applications such as the 2010 Microsoft Office system. The paper will explain how XenApp can benefit both sets of applications, helping to ensure that your Windows 7 deployment is as fast, cost-effective and painless to the company and users as possible. In addition, this paper explores the new features of XenApp 5 that enable applications to be delivered to users for both online and offline use. Furthermore, we will explore how applications published with XenApp integrate with the Windows desktop to allow users to work seamlessly between locally installed applications and virtual applications, whether they are streamed for offline use or accessed on remote servers for online use.